The verdict on the DeWalt DW745 10-Inch Compact Job-Site Table Saw with 20-Inch Max Rip Capacity has both positives and negatives to speak of, but it all comes down to you get what you pay for. For those looking for a quality jobsite saw which is affordable, then this is it. For your typical jobsite, there are specific power tools that allow you to get the job done. DeWalt continues to tend to the needs of woodworkers while giving them the versatility to accomplish flooring, carpentry, cabinets, and other tasks. Whether you’re an enthusiast or professional woodworker, DeWalt jobsite table saws are a great place to start. 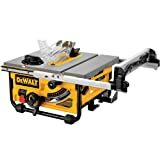 The DeWalt DW745 10-Inch Compact Job-Site Table Saw with 20-Inch Max Rip Capacity is another versatile power tool that meets the needs of users while packing a very affordable price. This job site table saw features a 20-inch rip capacity and is powered by 1850-watts of power. The portability and lightweight design makes it easy to move from jobsite to jobsite and accomplish all tasks in between. The DeWalt DW745 10-Inch Compact Job-Site Table Saw is a great power tool for those looking to take on smaller, light-duty tasks. Out of the box, you get a 24 tooth Series 30 saw blade, blade spinners, miter gauge, push stick, and dust port reducer. Some users have stated some of the parts are lower quality including a plastic top where others feature a more durable, metal top. Other parts of the DW745 are higher quality including the roll cage which is made of metal. The metal roll cage protects the saw from accidental drops and external damage which protects your investment for years to come. All the vital parts are enclosed in the roll cage including the rack and pinion system and rip fence. Boasting a maximum rip capacity of 20-inches, it’s large enough for most DIY projects. Weighing in at only 53-pounds, the DeWalt DW745 Compact Job-Site Table Saw offers an extremely lightweight and portable design. This jobsite table saw can easily be moved from location to location with ease and by only one user. There’s also onboard storage which allows you to conveniently store all your accessories and extras in one location for ease of access. Users have also come to appreciate the 2 ½-inch dust port. The port allows for simple attachment of a shop vac which vacuums does a great job vacuuming dust and other particles while keeping your jobsite or work-area clean. For reassurance, DeWalt includes a limited three-year warranty and a 90-day money back guarantee if you decide the DW745 isn’t for you. On the other hand, if you can spend a few more bucks you’ll find models with better quality including metal instead of plastic parts and a better miter gauge and T-square.